As you may have guessed from the title of this post, I'm indeed back to SDs again. I gave MSDs a try and it didn't work. So what went wrong? I think in the end slim minis are too young looking for my characters. Especially the boys. I couldn't find a sculpt for Tahir, because I have so many requirements for him, but I knew I could easily find an SD sculpt for him, and I also knew it would be tough finding sculpts for all the other guys. Both Ziya and Violet went to good homes in Denmark. I ended up buying an Iplehouse nYID Nancy instead, also from a local Danish collector. She will be Rose Keats from the Larika story. 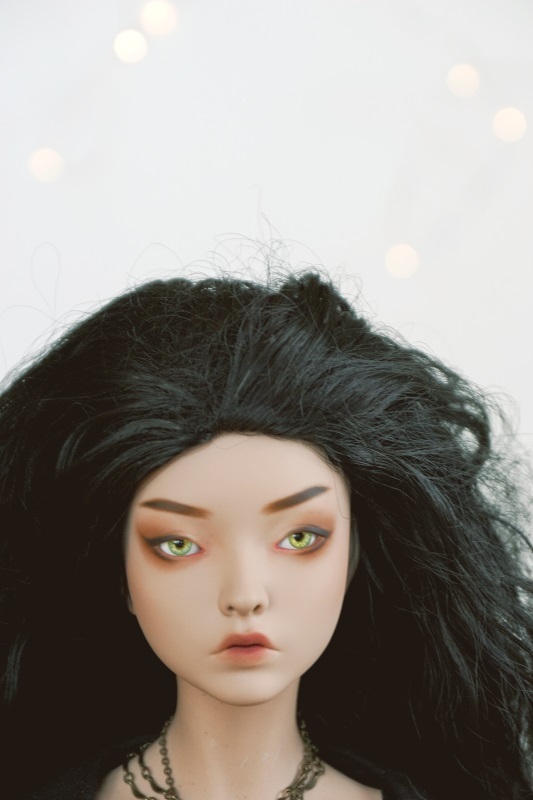 I'm currently waiting for a Natrume wig for her and I need to get her some blue eyes. Her previous owner Kia offered to paint her for me, which I gladly accepted because I adore Kia's style. I have been reinventing Rose's backstory and it's gotten more interesting in my opinion. I also finally figured out a good chunk of the background story for the Larika country. I'm gonna share it here, in case anyone is interested in reading it. So Larika is a country in a low fantasy universe, where the magic is divided by poles underneath the earth. The closer a country is to a pole, the stronger the magic is in that country. Larika is not particularly close to any of the three poles, so the magic is not that strong, and the only native magical beings from Larika was the Isanu people, who have now fled the country, due to the human invasion. The faes arrived much later to the country when they had to leave behind their home, due to war and left-over magic that had poisoned the island. There are four different fae species. The Terra faes, the Ignis faes, the Aqua faes and the ventus faes. The ventus faes took off to the east and are still living there, while the remaining three fae species ended up in Larika. From the beginning, it was a tense situation, because the faes entered the country and made a home for themselves without ever consulting the humans. The humans in Larika fear magic, and they didn't feel safe around the faes, and a lot of rules and laws were passed to keep the humans separate from the faes. The Aqua faes resided in the north of Larika. They preferred the snow and cold, and they rarely ever meddled with humans, so the humans left them alone. However, the Terra faes and the Ignis faes were forced to live in camps with restricted food and supplies, which meant a lot of faes tried to escape. Some made it, others were caught and killed, or ended up in the fae prisons. The Ignis faes tried to rebel against the humans, which led to the eradication of almost all Ignis faes. Even the ones who hadn't rebelled. Around 20 years prior to the plot the humans tried to make a genocide on the Aqua faes. However, a small portion of the Aqua faes survived and moved even further into the north, into the mountains, where they have resided since then. That's a great story! I wonder if humans and faes will be able to live in peace one day. That's true, MSDs look like kids so if your character is adult you need SD. Rose is gorgeous! Even those eyes suit her. Yeah, MSDs are not very suitable for adult characters sadly. Wonderful story and one can wonder what the small remaining faes have up their sleeves. I just hope it can be peaceful. Rose is so beautiful and I like the personality she has.